UK - Lighting designer Will Dart is using the rapid response Avolites Tiger Touch Pro to control his cinematic lighting concept for Indie rock band Bastille on their worldwide 'Bad Blood' tour. Scaled up from the spring and festival tour, Dart is using the Tiger Touch Pro console in conjunction with the Avolites Titan7 software to control a mix of cue to cue lighting states and moody live effects. Dart uses front projection onto an upstage backdrop screen augmented by wing drapes, which double up as both projection and up-lighting surfaces to give the show design a deep, moody feel. "The brief we had from the band was to create a mix tungsten effect lighting and video projection," explains Dart. "The original concept was to have something quite theatrical and cinematic going on behind the band. We've used a lot of footage from the band's music videos and these images are what provided the inspiration and concept for the shows lighting design." 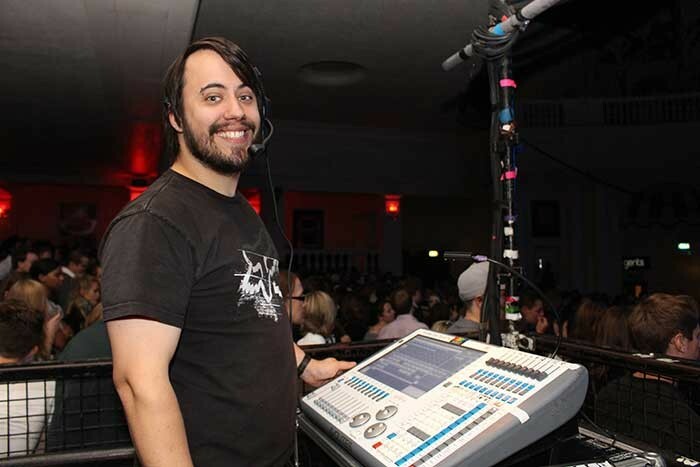 Dart is no stranger to Avolites having used the original Tiger Touch in a series of tours earlier in the year including the Dappy UK tour, Don Broco UK tour and the Bastille spring UK tour and festivals. "We used the Tiger Touch on previous tours and it worked so well that I now spec Avolites desks for most shows," continues Dart, "On this tour we are visiting much bigger venues 1500 - 5000 capacity (earlier in the year we were going into venues of 300 to 2000). For both we needed a console that could handle the varying sized lighting rigs and different types of fixtures, which is exactly what the Tiger Touch Pro does." The Tiger Touch Pro also enables Dart to add in flashes of strobe and blinder effects on the fly. For Dart, it's the sheer plug and playability of the Tiger Touch that keeps him specing it on jobs. "We don't always have a lot of time to set up," explains Dart. "We need to get data out to the rig as quick as possible to test that everything works. The quicker this happens the more time I get to program the rig; there is no messing around with all the internal, nitty gritty bits. This gives me much more creative freedom - you could just get this console out of the box and it would work, straight off the bat." The Tiger Touch Pro balances its powerful software capabilities with its small, lightweight exterior. 20 submasters, separately paged as two banks of 10, and a further 20 macro or executer buttons allow fingertip control of the Titan7 operating system. Outputting up to 16 individual DMX universes with an expandability of up to 64 DMX universes, using the Titan Net Processor, means the desk offers a huge range of control channel options and shares the processing load of your show. "The user interface is fantastic as it designed so nothing is ever more than a click away,” continues Dart. "When you are in the middle of the show you don't want to have to think about how do I get to that window or access that feature, instead it's just there in front of you, which is great when you are doing a lot of on-the-fly programming in a live situation such as this." Koy Neminathan, Avolites sales director adds: "We are delighted that Will has chosen to use the Avolites Tiger Touch Pro and that it has achieved exactly what it was designed to deliver - a fast intuitive interface that enables show scalability, the ability to swap out fixture types and brands easily, programming and operation on the fly or cue to cue and all on a reliable and robust platform. Will has done a fantastic job on the design and we look forward to supporting him further with the scaled up version of the tour next year." In picture: Dart is using the Tiger Touch Pro console to control a mix of cue to cue lighting states and moody live effects.